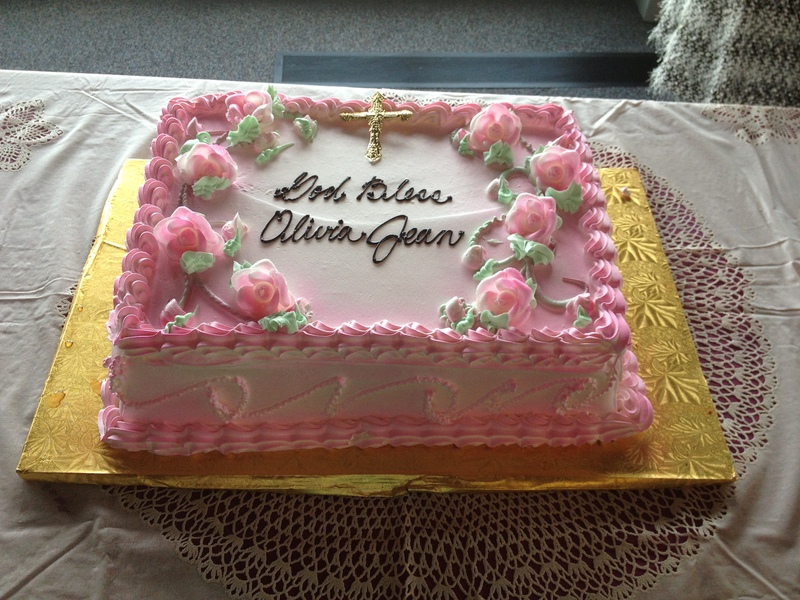 We recently celebrated our baby girl’s baptism with a pink and champagne party theme. One of my favorite hobbies is planning events. From our kids’ birthday parties to volunteering to help with local nonprofit organizations’ fundraising events, I find it challenging and fun at the same time. I thought I’d share a few details from our pink and champagne baptism celebration in case you’re looking for ideas. Of course, our families also enjoy party planning, so I always have a lot of help from my mom, my mother-in-law, my aunt-in-law, and in this case, godparents, and quite a few people from our church. Of course, all of the little parties we plan for our kids are low-cost events. 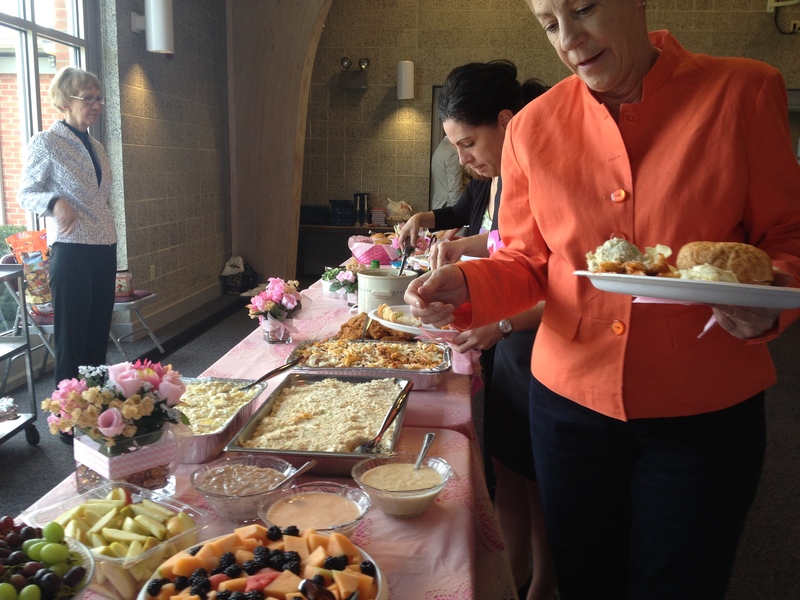 In this case, we hosted a buffet luncheon after the baptism service in our church’s Great Hall, which is beautiful and has plenty of space. 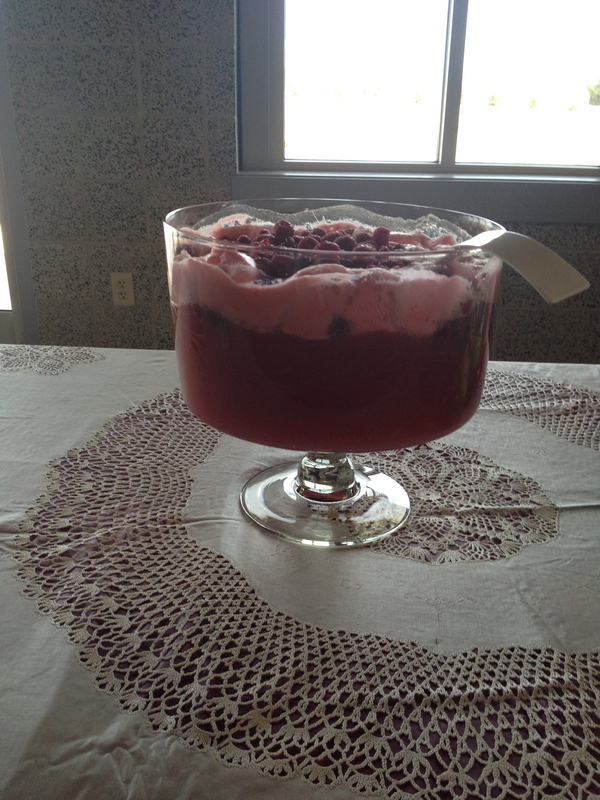 We served cold veggies, fruit and fruit dip, chips and dips, hot roast beef sandwiches, my brother’s famous chicken salad on croissants, potato salad and mostaccioli made by our aunt, as well as cheeses and crackers. We made a pink punch, though it came out a little more red than anticipated, and also served juices and milk for the kids and soda and coffee for adults. 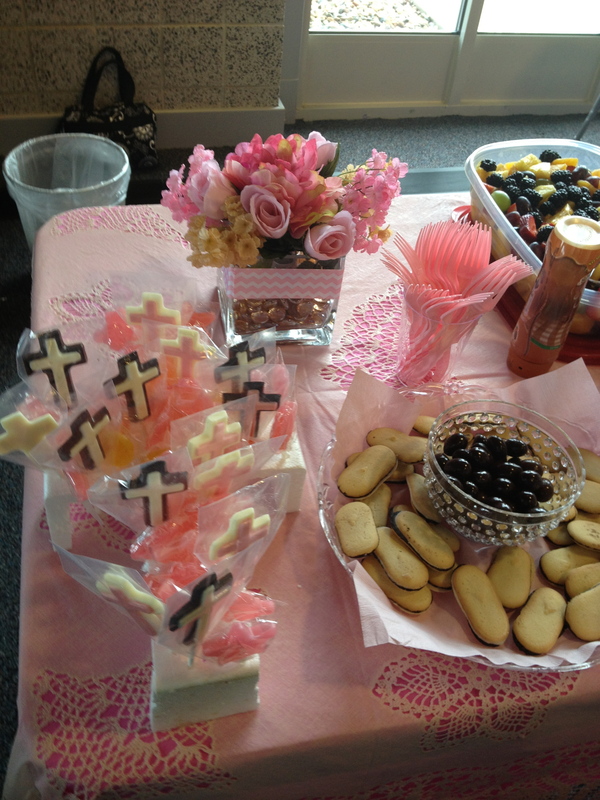 For some reason, our dessert tables always are pretty elaborate. Our aunt brought a beautiful, delicious cake from Weber’s Bakery in Chicago and my mother-in-law made adorable chocolate crosses. We tried to stay within the pink and champagne color scheme, but it ended up being a little more of a pink chevron theme … with a splash of champagne and other shades of pink. 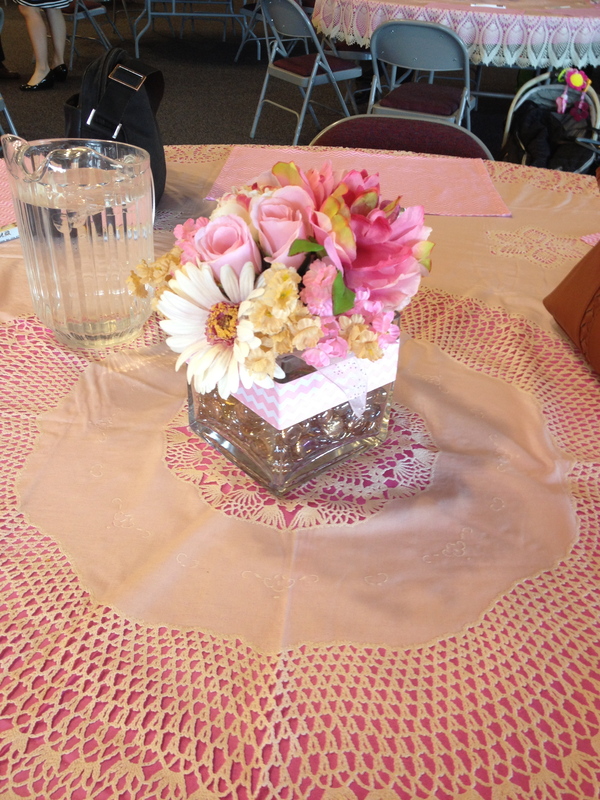 We used low square glass vases for the flowers and placed champagne-colored beads at the bottom of them. 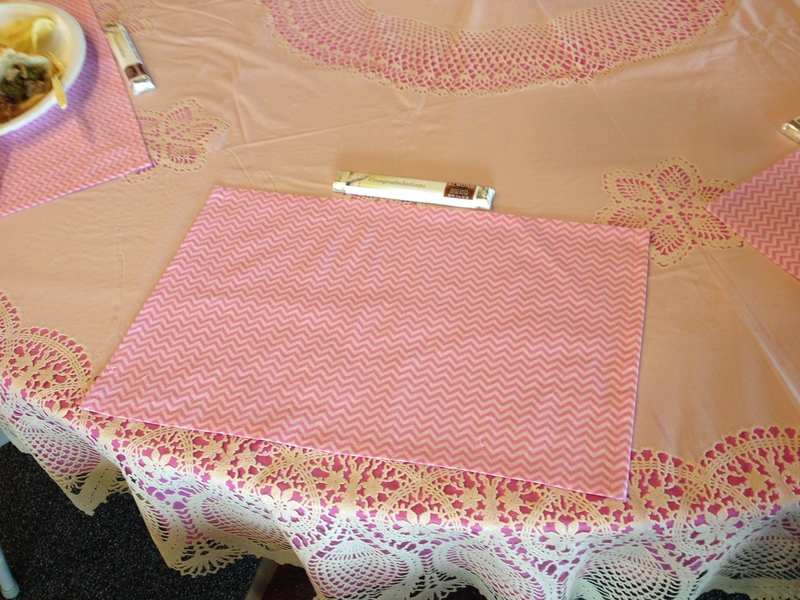 The church had lace overlay tablecloths that we laid over pink paper tablecloths with pink chevron placemats. Very pink, but turned out cute. For favors, we placed a World’s Finest Chocolate bar at each setting. Most importantly, it was a great, fun day with our family celebrating our baby girl’s baptism!